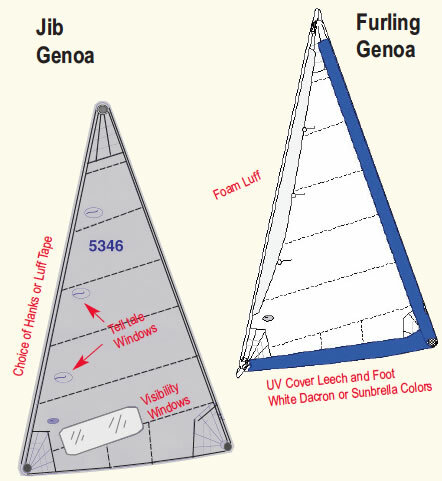 Use this section to help understand & choose your custom sail preferences. Standard Battens have been the industry standard for many years. They support the trailing edge and allow the sail to have a modest amount of “Roach” which is any material that extends beyond a straight line drawn from the head to the clew. 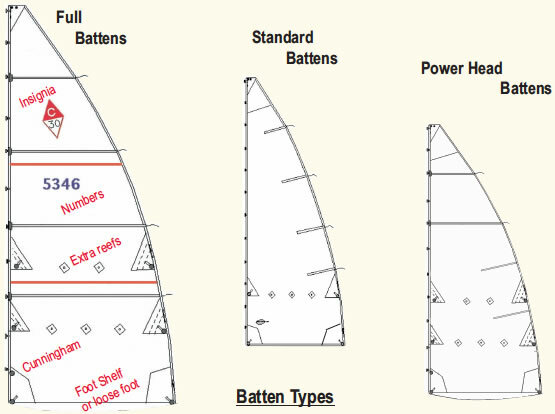 Full battens allow even more roach which increases sail area by about 4 to 5% over the standard batten design, giving noticeably more power in light air and better sail shape. Full battens eliminate flogging while motorsailing to windward or luffing of the mainsail while overpowered. This combined with the elimination of the stress concentration inherent in standard length battens increases longevity. Full battens will work exceptionally well with lazy jack systems too. Expect a slight increase in the luff friction when raising and lowering the main but on most boats up to around 40 ft. it is not necessary to use any special luff hardware. Standard slugs or slides work adequately. The use of a slide lubricant such as “Sailkote” helps greatly. Powerhead Battens gives you most of the advantages of having all full battens but less friction in the luff when raising and lowering the main. The Powerhead main sail has 2 full battens on top and 2 short battens on the bottom. Most small boat OEM type mainsails come standard with one row of reefing points. If you need more than one reef we suggest upgrading to the Coastal or Offshore version sails since they are built heavier and therefore more suitable for strong conditions. The reef prices shown apply only to custom mainsails, (we don’t add reefs to sails that are already in stock). Both options allow the foot of the mainsail to become more full when the outhaul is slackened. This gives more power for reaching and running. A Foot Shelf and Loose Foot are available separately or in combination. There is no extra charge for a Loose Footed main. Insignias for most boats are available when the sail is made. If we don't have it we can duplicate it from a graphic that you supply. (Insignias are available when the sail is purchased only). Necessary for identification while racing the boat. Usually your hull number is put on the mainsail. Available with a sail purchase only. Can be added to a stock sail as well as custom sails. Remember, you need one set on each side of the sail. Size - 9” black only. This is a downhaul ring in the luff of the sail to which a tackle can be rigged. More luff tension helps flatten the sail and brings the draft forward. This helps the shape in choppy water or stronger winds.Cunninghams can also be added to a stock mainsail before shipping. Clear vinyl windows increase visibility and safety by reducing the risk of collision. Window placement is determined by the sail design department therefore not guaranteed to be exactly where you prefer. (Not recommended for furling genoas). Made from clear vinyl, these small windows allow you to see the tell tales on the lee side more easily. Headsails only. (Not recommended for furling genoas). TT Window only $39 ea. A Roller Furling Genoa needs protection from sun damage on the leech and foot while furled. All UV covers are sacrificial and will need to be replaced eventually. White Dacron is lighter and less stretchy but colored Sunbrella lasts about twice as long. UV covers can last anywhere from about 2-10 years depending on the climate and sun strength. Gives better sail shape by helping to flatten the sail when it is partially rolled up. This extends the effective reefing range by 5%-10% over non-foam luff furling genoas.